I had the opportunity to walk Light+Building 2018 held every two years in Frankfurt, Germany. To say I walked the show is an exaggeration because it is just too large to walk, plus I had little interest in lighting which comprised most of the show. There were eleven halls, but some halls had multiple floors. Electrical Engineering, Home, and Building Automation were assigned to halls 8, 9 and 11 and that was my area of interest. With over 220,000 visitors from 177 countries, this was not just a German show. As much as 52% of the visitors and 70% of the 2,714 exhibitors came from outside of Germany for this six-day show which started on a Sunday. Here are a few of the things I found interesting. Delta Controls had a new product called the O3 room controller. Instead of having multiple sensors within a room to confirm the room is occupied, it had one larger ceiling-mounted sensor with multiple sensing modes that include temperature, light, and sound. The manufacturer claims increased reliability through intelligent sensing and better comfort through configurable profiles. There is an O3 app for mobile phones and multiple protocol support for EnOcean, Dali, BACnet, Smart Motor Interface and Modbus. The BACnet Interest Group Europe (BIG-EU) again hosted a common stand for its members where participating companies had a one-meter wide vertical panel to explain their products. New this year was an open conference area adjacent to the stand called Open Building Automation where member companies were given speaking slots to explain their products or introduce their technologies. Scott Muench of J2 Innovations, Andy McMillan of BACnet International and Ron Zimmer of CABA took advantage of the opportunity. After 5:00pm each day the BIG-EU served beer, but on Tuesday it was champagne in honor of their 20th anniversary. 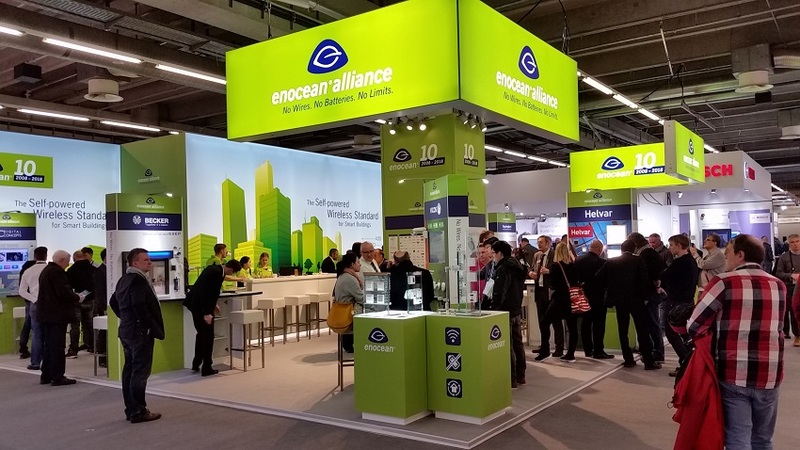 The EnOcean Alliance also has a common stand for its members, and it was always quite active with visitors. Instead of a 20-year anniversary, they were celebrating 10 years. The years do fly. One other association at the show that was new to me but existed since 2014 was the IP500 Alliance. IP500 is a standard for wireless smart devices in building automation. It has an impressive list of members mainly based in Europe. At the top of the protocol stack is BACnet and at the network layer is IPv6 over wireless 6LowPAN. What was interesting was that it reminded me of Tridium’s original Sedona Framework running on top of 6LowPAN. That was over ten years ago and perhaps ahead of its time. The Light+Building show is often called the KNX show because of the dominance of companies promoting this technology at the show. At each show, they run the KNX Top Award event with entertainment, food and plenty to drink. This year 2,000 were in attendance proving that even in our industry people like to have a good time. You can see all the winners from the KNX show at https://www.knx.org/knx-en/Landing-Pages/KNX-Award/.